The Partial Hospitalization Program (PHP) is appropriate for people who have either completed residential (inpatient) treatment or others who require an outpatient setting. It is common for patients to step down to PHP after inpatient treatment and sometimes again to IOP. For others, PHP might be a needed resource after a relapse of symptoms that bring the disease of addiction out of remission. 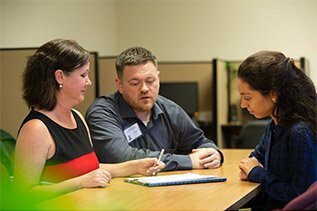 Individual, group and family therapy sessions help our patients identify life stresses and healthy ways to reach recovery. Compulsive gambling treatment with therapists who have specific training in problem gambling. Individual sessions offered in a confidential setting for the gambler and their families.